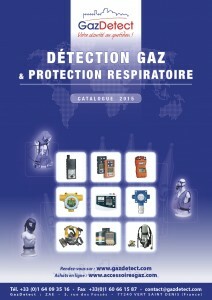 Read or download our Gas Detection and Respiratory Protection catalogue. Over 200 pages you’ll find a complete selection of the most effective equipment for safety at work. Our catalogue is available online through Calaméo (click on the image). PDF download is also available for off-line reading by clicking the link below the picture. Disposable gas detectors, single-gas detectors, multi-gas detectors, area gas monitors and accessories. One-off gas measurements with more than 400 units for toxic, combustible or asphyxiating gases and for compressed air quality analysis. Combustible, toxic or asphyxiating gas detectors, optical flame detectors, and open-path gas detectors. Single-channel controllers, multi-channel controllers, 19” rack systems, gas detection cabinets. Single-gas or multi-gas mixture cylinders to perform periodical checkings, calibrations and bump tests of gas detectors. Sound alarm devices, sirens, visual alarm devices, rotating beacons, ATEX airtight audio visual combinations. Automatic or manual reset safety valves, air/gas pressure switches, safety boxes, gas manometers. Emergency stops, switches, break glass call point, cable glands, junction boxes. Respiratory protective filters, gas half masks and full-face masks, powered air respirators and hoods, VOC respiratory protection, welding gas respirators. Escape masks, self-rescruer respirators, closed-circuit self-contained breathing apparatus, man down detectors, thermal cameras.